Key Difference: A distinguishing feature of the Doric column is that fact that they have no base. The column itself is short, stout and heavy. The shaft of the column is fluted, usually with 20 flutes, while the capital is simple and flared. Ionic columns are considered to be the tallest and thinnest of the three types of columns. The main distinguishing feature of the ionic column is the volutes on top. These are often called scrolls. Greek architecture is outlined by three main architectural styles: the Doric order, the Ionic order and the Corinthian order. These three orders have distinctive styles; however, the most recognizable distinctions of the orders are their columns. Each column is composed of a base, a middle shaft, and a capital. The columns support the entablature, which includes the frieze. The entablature in turn supports the triangular pediment, i.e. roof. The Doric style of column is the oldest and the simplest form of the three columns. They were mainly predominant during the 7 to 5 centuries BCE. The Doric order originated on the mainland and western Greece. A distinguishing feature of the Doric column is that fact that they have no base. The column itself is short, stout and heavy. The height is only four to eight times the diameter of the column. The shaft of the column is fluted, usually with 20 flutes, while the capital is simple and flared. These columns are usually pretty plain and least decorated. The entablature is divided into three horizontal registers. The lower part is either smooth or divided by horizontal lines. The frieze is divided into triglyphs and metopes. A triglyph is a unit consisting of three vertical bands which are separated by grooves. Metopes are plain or carved reliefs. 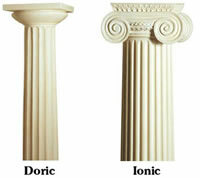 The Ionic order originated in Greek Ionia, eastern Greece, around 6th century BCE. Ionic columns are considered to be the tallest and thinnest of the three types of columns. The main distinguishing feature of the ionic column is the volutes on top. These are often called scrolls. The column consists of slender, fluted pillars with a large base and two opposed volutes in the capital. 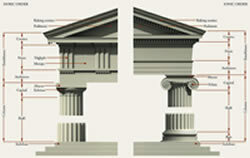 The Ionic shaft has 24 flutes, as opposed to the 20 on the Doric column. The column shaft also tends to be slender at top as compared to the bottom. The height of the shaft is usually eight diameters high. The architrave of the Ionic entablature consists of three stepped bands called fasciae. As opposed to the Doric, the Ionic frieze does not have the triglyph and metope. Instead, the frieze may have continuous ornament, such as carved figures or bas-relief carvings of historical events or myths.